The Pashupata group is the oldest known Shaivist group, made of ascetic monks. Their name derives from Pashupati, a name of Shiva, meaning the “lord of animals”, in fact of all creatures. 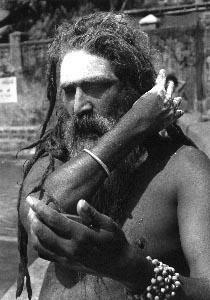 The members of the Pashupata Shaivism were said to have wandered across the country, making the dust of the roads rise, having with them their iron tridents or solid cans, their hair oiled and wild, or kept in a loop, their faces burning with intense devotion, and having keen eyes that see Shiva more than the surrounding world. They wore deer leather or bark on their hips. The Pashupata were devout (bhakta-s) and Shivas white magicians, estranged from a Vedic society dominated by priests. The religious unrest from India intensified with the coming over the Gangas field of the two waves of agama-ic Shaivist and Buddhist theism. The Pashupatas evolution and way of life were described by several historians of the time, who sometimes were hostile and left an ambiguous impression on their life and philosophy. 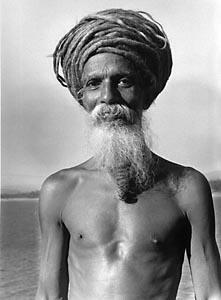 Initially, the Pashupatas would allow anyone to follow their path, disregarding of the caste and social status. However, once the Pashupatas popularity increased, a great number of Brahmins joined this movement in order to worship Shiva in unconditional abandon. Nonetheless, in many cases it was preferable for a Pashupata to come from the Brahmin caste. The relationship between these Pashupata monks and the sadhu-s covered in ashes is uncertain. They may be the same or they may be different. 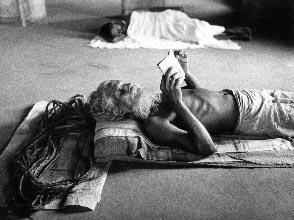 The Pashupata sadhu-s imposed a religious respect wherever they would go. Their path was tough, a path of ruining the ego, designed to infuse the seeker with the karunya (Shivas compassionate grace). Their austerity was combined with rites (puja) of worship devoted to Shiva, with a profound awareness of the Cosmos as being the perpetual becoming of Shiva, and with a playful spirit of love for Him. The sadhana (spiritual practice) usually begun with the deepening of an ethical code (yama and niyama), the accent being laid on brahmacharya (abstinence, continence), ahimsa (nonviolence) and tapas (austerity). As it was detailed in their scriptures, the discipline was practiced on stages. For the beginning they would assume various vows, and would practice various techniques for the release of the blockages. These techniques included laughing, singing, dancing, all impregnated with the shaivic spirit. In the next stage, they disappeared into the society and lived incognito. Here, they would practice various shocking actions, with the purpose of attracting the public disapproval and condemnation, gossiping, making strange sounds while in public, snoring, walking about as if they had been crippled, and so on. This sadhana was a means of self-purification, of annihilation of the ego, of elimination of the instinctual need of being accepted in a group and society, and to implant into the subconscious the idea that liked or disliked, good or bad, all the opposites are equivalent if ones love for Shiva is truly powerful. This stage of the practice was designed to break the ties with the society and even with ones own attachment for the human situation in which they appeared in this world. Coming back to their sadhana, the Pashupatas were said to perform various austerities, them abandon any other action to practice kundalini yoga, so that they would come ever closer to Shiva. When this union with Shiva grew in maturity, they would obtain super-natural powers (siddhi), such as omniscience and others. The Pashupatas believed that when a person was firm in his or her virtue, and that person is capable to take serenely any abuse and insult, this person is well-established on the path of ascesis. Shri Kaundinya wrote in his commentary from the 6th century, Pancartha Bhashya on the Pashupata Sutra that the Pashupata yogi “must appear as lunatic, beggar, with the body dirty, grown beard, long hair and nails, with no care whatsoever to the body. Thus, the devotee cuts off his or her access to fortunes (varna) and possessions (ashrama), and only thus the power of detachment is genuinely produced”. The Pashupata-ism is first of all an ascetic path that does not value the dialectic logic and values instead sadhana as a means of obtaining Shivas grace. The seekers on this path embrace strict vows regarding the observance of the ethical code yama and niyama, their sadhana ranging from “action” to “non-action”. The devotional action included puja, penitences, Namah Shivaya japa, wearing the sacred ashes, and the proof of their infinite love for Shiva.